Turtles are out and about, and they have started crossing the roads again. I know this blog is supposed to be about gardening, but wildlife is an essential part of my garden, and one of the things I love most about it. Maybe we need an unofficial Turtle Crossing Society. Members would pledge to take time to drive a little slower, watch a little more closely, and take time to give turtles a bit of help getting across safely. I know there are many potential members out there, because I’ve seen people stop their cars and carry turtles to safety. From now until cold weather returns, I watch the road closely. In addition to turtles on the pavement proper, I always keep an eye out for ones on the berm. If they’re pointing away from the road, they’re probably okay. (I still stop and move them all the way off the pavement.) If they’re on the edge of the road and pointing toward it, stop and give them a safe, quick lift across. When moving turtles, always carry them in the direction that they are pointing. In other words, don’t pick them up and move them back toward the edge of the road where they started. They’ll just walk back out into the road. Ideally, carry them straight across and set them down several feet away from the edge of the pavement. (Don’t forget to look both ways before crossing yourself!) If they’re walking into more trouble—into a field that’s being plowed, for example—move them to another safe location. Sliders and other aquatic turtles can go to a nearby pond or waterway. 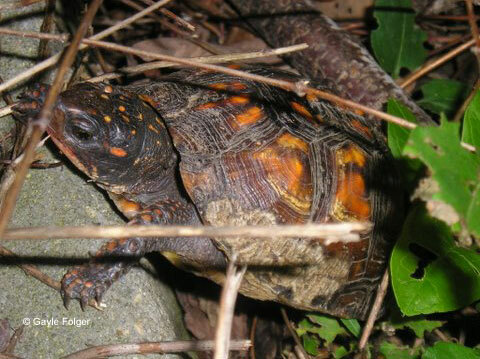 Box turtles are best moved toward woods edges or hedgerows. Snapping turtles are a bit harder to rescue, and they’re not shy about walking toward you and trying to bite. A broom or a shovel makes a safe handling tool, as does a stout stick. Use it to gently push them in the direction they need to go. Just take care to stay well away from the jaws! So, I hope this post will recruit some new members to the new Turtle Crossing Society. Now that I think of it, snakes could use similar help. Not only do they cross roads, they also enjoy basking on them. You may see me helping them across, too. Now that I think of it, I’d better put the broom back in my car so I’ll have it handy. Okay, two official members and counting! I am also a member and even stop for the little snappers. The big guys are on their own! Last year I even had a paint turtle on top of the pool cover–lol. I do wish there were more box turtles to be seen nowadays. Hi Terri! I’ve pushed a couple of big snappers off the road, but with a sturdy broom or gardening tool. We actually see box turtles pretty frequently up here. I especially love seeing the tiny babies, and usually see and move one or two of these every summer. I used to see box turtles a lot, now I rarely seen one. I wonder if its a environmental issue. I know habitat destruction is a big problem. There’s not much for them to eat in the average backyard. I’ll try to do a post on food plants this summer. Plus lots lose their lives on roads every year. Yeah! My friend and I were just talking about that while hiking around yesterday. Every time we used to go fishing, we’d see a box turtle or two. Now, I never see them anymore. Has the Eastern Box Turtle gone south, perhaps? I save at least 3 turtles a year, usually on the same stretch of road. That’s great, Paul! I see both sliders and box turtles every year, and stop for them all. Saving them makes my day, too. I am even happier when I see someone else stop and save one–like you. It is nice to know that other people do it, too! They really need our help.